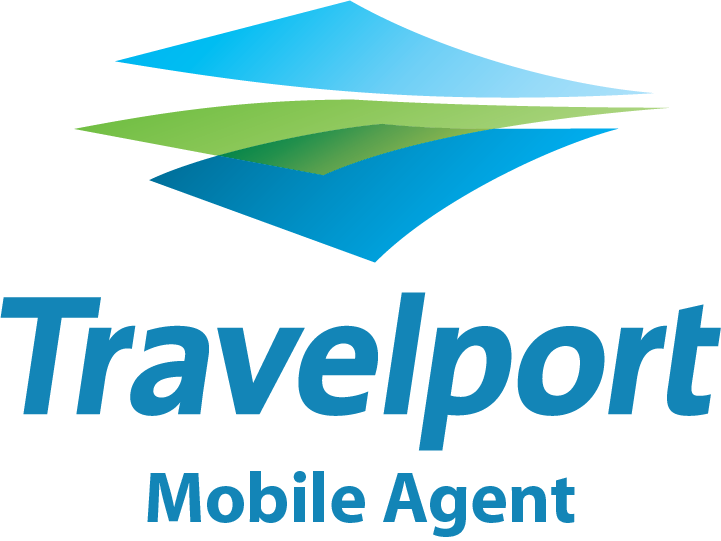 Travelport Mobile Agent is a mobile application for iOS, Android and Windows Phone that provides access to all Travelport GDSs. It allows travel agents all over the world to work on their Apollo, Galileo or Worldspan terminal on mobile devices, offering full mobility to the travel agent. Offer a 24/7 customer service without the late runs to the office. Use your GDS anytime, anywhere! Available for iOS platform, iPhone, iPad, iPod Touch, for Android and Windows Phone, supporting more than 10,000 devices. 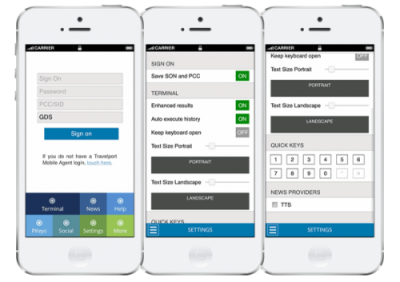 One single app, the same functionality for all Travelport GDS systems, Apollo, Galileo and Worldspan. 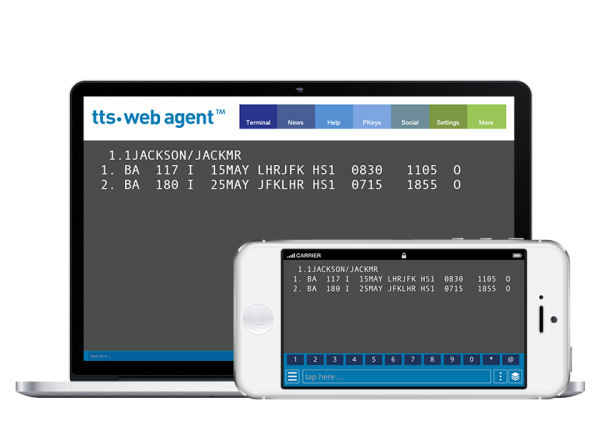 All Travelport Mobile Agent users can have access to TTS Web Agent, the web-based GDS access that works on Windows, Apple Macintosh and Linux. Check out how Travelport Mobile Agent will enable you to increase your productivity and help your clients. Getting back or staying until late in the office to solve emergencies or finish work is now a need of the past. Access your most important working tool, your GDS cryptic terminal, anytime, anywhere. Offer great customer service by helping your customers right when they need and transform every opportunity in value. The GDS response is fast and typingless features, like Linked commands, Enhanced results, Pkeys, History, Queues watcher, My PNRs, Double Window just to name a few, were carefully designed to take the best out of touch interaction to provide you a fast mobile work environment. 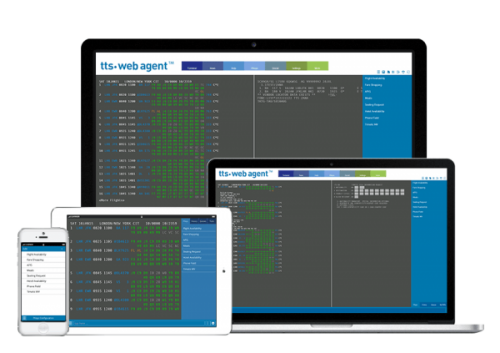 PKeys, History, My PNRs and Settings are stored in the cloud enabling full synchronization between devices to offer you the exact same content on all devices: smartphones, tablets and even big screen when working with TTS WebAgent. It allows users to change devices and pick up where they left off, meaning that users can start a reservation at Travelport Mobile Agent in their smartphone and finish it on their laptop TTS WebAgent, without having to EndTransact before changing devices. Email Templates allows Travelport Mobile Agent’s users to customize different emails with information from a wide variety of segments and have them ready to send to their clients when the time comes. 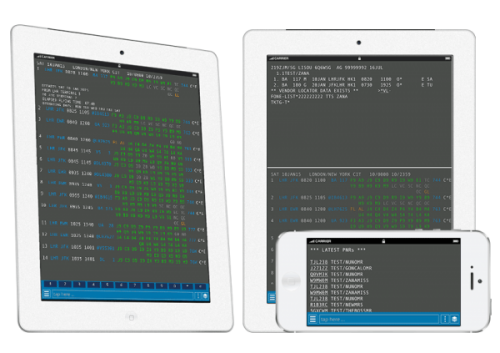 Set your mobile terminal like it suits you best, save your GDS credentials and make it even easier to login, change font size, turn on or off enhanced results and auto-execute history, customize your quick keys and more. 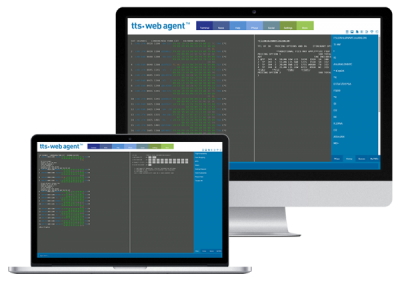 TTS WebAgent is a web-based application that offers the Travelport Mobile Agent experience adapted for laptops and desktops and it’s available for all Travelport Mobile Agent users. 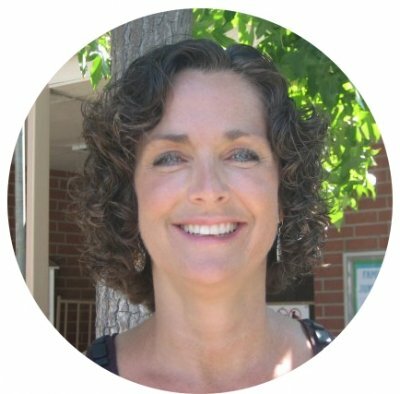 Get to know Mary and learn how she improved her productivity and her travel agency’s customer service and gained more time for her personal life. What I truly enjoy about the TMA is both the ease and rapid response of the system. Using near intuitive software, it allows quick access and constant updates of my entire office’s PNR’s. Utilizing a large variety of tools, it gives me the confidence to manage all of my reservations no matter where or what I am doing. I love Travelport Mobile Agent! It’s nice to be able to look up schedules and irregular operations when I am out of the office or traveling. I’ve used it both for myself and for clients! The days of having to worry about carrying a laptop to have access to my clients’ reserva- tions are over – this is a must-have application in today’s world of 24/ 7 accessibility. Get full mobility. 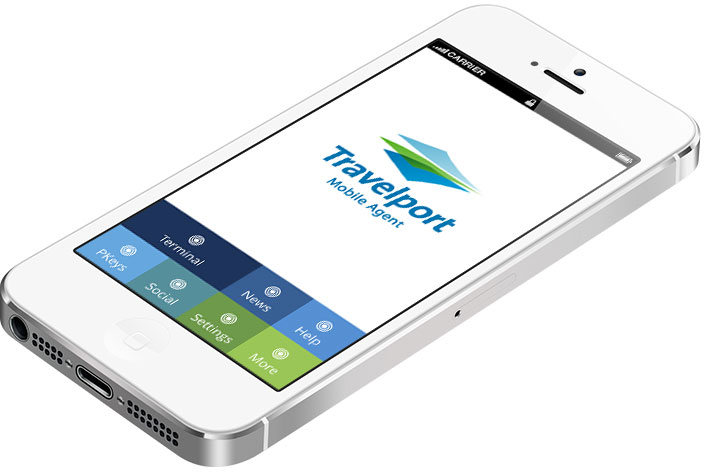 Download Travelport Mobile Agent now! It allows travel agents to offer something that self-booking tools don’t – the security of a familiar face and voice. By providing access to Travel Agents’ most important working tool on mobile environment, it enables your agency to help its clients in real time, in the moment they need. Travelport Mobile Agent is the only solution offering access to the GDS on smartphones being the only application that really offers full mobility to Travel Agents. By enabling a real 24/7 service, it promotes a stronger relation between your travel agency and its clients which will result in higher rates of client loyalty & retention. It offers work environment access anytime, anywhere while releasing travel agents from being stuck to their desktop. It maximizes business opportunities since allows travel agents to service customers anytime.